The EDGE 850 is a digital color printer for printing BS 5609 section 3 compliant labels for chemicals and drums. This printer is 8.5 inches wide and features a simple roll to roll system for printing. 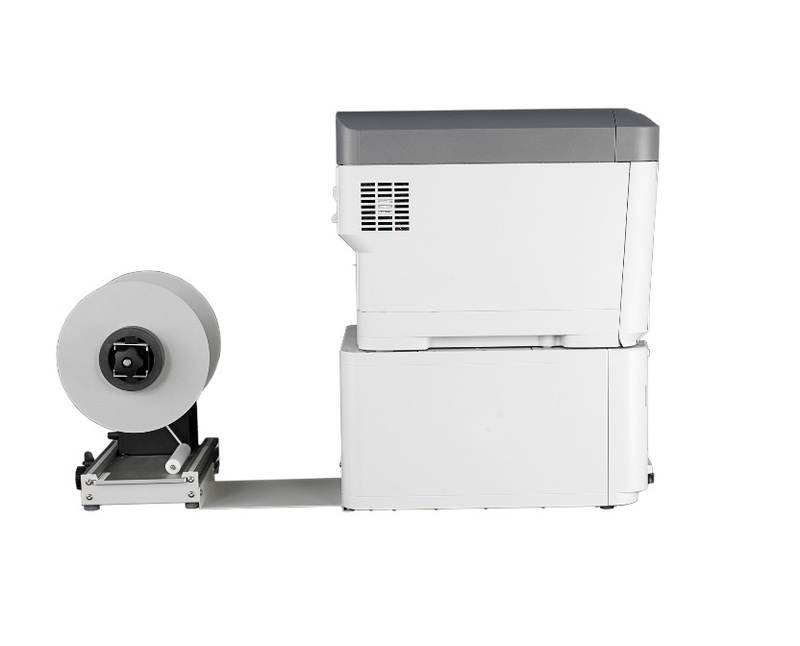 The EDGE 850 roll to roll digital label printer is ideal for printing full color GHS BS5609-compliant chemical and drum labels on demand. Die-cut labels printed on the EDGE 850 deliver outstanding stability and resistance to water, chemicals, fading and smudges when exposed to the harshest of elements. As a result, the EDGE 850 will allow users to eliminate the need for ordering pre-printed labels, reduce inventory and wait times, and allows users to customize each label with variable information in full color - all in a single pass. Mark Hopkins, President of iSys Label, presents the latest developments in short run digital label printing. iSys Label has released their newest software plug-in that provides users with the ability to print using white toner and the ability to print and cut individual BS5609 compliant labels for the hazardous materials market. Print speeds of 4.33 m/min and upwards, which is 15 8.5x11 labels per minute. The Globally Harmonized System of Classification and Labeling of Chemicals (GHS) is an international system that was created by the United Nations and ensures global consistency for the labeling of dangerous goods. British Marine standard BS5609 is a requirement for self adhesive drum labels needing International Maritime Dangerous Goods (IMDG) certification for shipment. These standards set out various criteria for label durability when dangerous goods are being transported in marine environments. It stipulates that the drums and containers used to contain the hazardous goods, be durably marked and remain identifiable for at least 3 months being immersed in the sea. In order to print fully-compliant drum and chemical labels the facestock, adhesive and printed graphic all need to meet the requirements for sections 1, 2 and 3 of the BS5609 standards. In addition, the graphics of the labels must comply by utilizing the standardized black and red pictogram system accompanied with the precautionary text layouts. The Thing You Must Ask Yourself: Am I Really Compliant? Most manufacturers believe that they are fully compliant by simply using compliant label materials. This is not the case. It is not sufficient for a chemical manufacturer to simply use compliant label facestock. To print chemical labels that meet full International Marine Dangerous Goods (IMDG) compliance the media, the adhesive and the printed image all have to pass Sections 1, 2 and 3 of BS5609 certification. Section 1 Compliance: Provides an overview of BS5609 and a description of the general requirements and actions that need to take place, including the use of specific pictograms and text laid out to convey the hazardous information. Section 2 Compliance: Outlines the requirements for testing the blank label's base material, which includes the adhesive on the back on the material. Testing procedures include exposing to artificial weathering (salt spray & sunlight), dimensional stability and adhesion. When a label is Section 2 compliant, it means only the blank label is BS5609 Section 2 compliant. Section 3 Compliance: The difference between Section 2 and Section 3 is that the printed label is tested, whereas Section 2 is only testing the blank label stock. With Section 3 compliance, labels are tested for abrasion resistance and permanence of print. This test must be done using the exact substrate that has passed Section 2, as well as the printer and proper settings used for printing. The requirement is that the printed label survives at least three months immersed in seawater, can be removed and is still legible. This test must be passed successfully before a label can called BS5609 compliant. EDGE2Print is a full featured, easy-to-use software package that was developed exclusively for the company’s short to mid run digital label printers. The EDGE2Print software enables users to drag and drop their label graphic, select the exact quantity needed and press print. By combining this short run digital label printer with the easy-to-use software, users can print their chemical or drum label on die-cut substrates and have the labels ready for immediate application that day. The EDGE 850 MP is a driver-based solution for roll to roll and roll to cut printing. Users will be able to print individual labels as they need them and automatically have them cut afterwards, making it ready for hand application. Users of the driver will be capable of printing their label graphics straight from various Windows applications, allowing for a fully integrated internal workflow solution. The Imaging Systems Group Inc., provides leading edge performance printers for oil and gas exploration, seismic data recording, well logging, geophysical, marine, engineering consultants, aerospace, government agencies, CADD, newsprint, chemical, graphics arts, labels and more. Thanks! Please go to your email and click the opt-in button to confirm. Copyright © 2018 The Imaging Systems Group, All rights reserved.